Our Guest Blogger this week is Ron Gantt,CSP, ARM, CET- Vice President of Safety Compliance Management. Ron has been an integral part of SCM for more than a decade. Recently the Protecting America’s Workers Act was introduced in the US Congress to implement significant changes to the 1970 Occupational Safety and Health Act that developed the US Occupational Safety and Health Administration (OSHA). Among the most significant changes are changes to what is known as the General Duty Clause, which currently requires that employers provide a safe workplace to their employees. The proposed changes would require employers to not only protect their employees but also all other employees in the workplace. This means that OSHA would evaluate not only your internal safety programs, but also how your safety programs protect visitors and contractors. This new requirement would be consistent with many of the recognized safety management system standards, such as ANSI Z10-2012 and OHSAS 18001:2007, which require contractor safety programs. Making employers at least partly responsible for the safety of visitors and contractors at their site is one of those “easier said than done” things. After all, we don’t have nearly the control over contractors that we have with our own employees. So how can we control their safety programs? Well, using a 4 Step Model to contractor safety management (seen below), you can comply with any forthcoming regulations and help take your overall safety management system to the next level. Step 1 – Pre-Job Planning. As Steven Covey said, begin with the end in mind. If you want your project to end safely, create solid safety specifications for any contractor that walks into the door, rather than leaving it to chance. Every job should begin with a thorough risk assessment where the applicable hazards and risks are identified, analyzed and prioritized. Then you can implement specifications to make sure risks are reduced to acceptable levels. By doing this you can influence the design of the project to ensure that safety is considered at all phases. You can also implement controls into the design that assist in implementing other safety controls, such as ensuring adequate anchor points exist in those areas where employees may need to use fall protection. More mature organizations can even identify the highest risk jobs and create specifications for ensuring that the crews working those jobs have the right SafetyDNATM (individual traits and abilities related to safe behavior). For example, jobs at your facility with higher levels of inherent risk may require higher-than-average levels of awareness, vigilance or risk avoidance. Validated psychometric tests that measure SafetyDNA can be a valuable tool for this purpose and can help you ensure that you put the safest, most skilled individuals into your most critical or hazardous roles. In the early phases there may not be enough information to identify all hazards and risks, which is why the risk assessment process should continue throughout the project. But the earlier we can start identifying and reducing risks the easier they are to deal with. 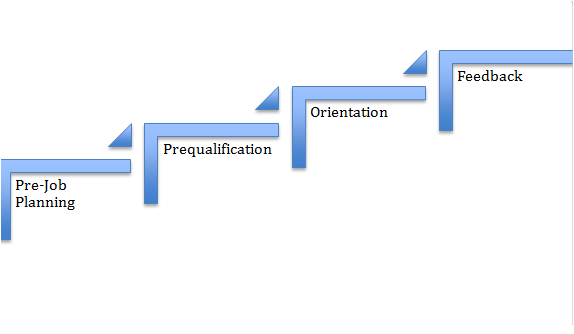 Step 2 – Prequalification. This is arguably the most important part of contractor management. If you may be held responsible for contractor safety performance, wouldn’t it make sense to look at the safety performance of the contractor BEFORE they get in the door? This can be accomplished through looking for a combination of lagging indicators (e.g. incidents rates, EMRs, etc.) and leading indicators (looking at the management systems that are in place, the contractor’s internal training programs, whether or not the contractor uses safety as a criteria for selection and development of employees, etc.). What you look at should be based on the risks of the job, with the higher risk jobs requiring more indicators to show positive safety performance. But if you’re not screening contractors based on safety performance you shouldn’t be surprised when you have to deal with a contractor that doesn’t have a mature safety management system. Likewise if you bring on a contractor that does not consider the SafetyDNA of its employees when it hires or trains them, don’t be surprised if they soon display at-risk behavior or a lack of respect for safety once they are on your site. Step 3 – Orientation. Once you’ve identified the job specifications and you’ve found your contractor with a mature management system, then next step is to ensure that the contractor is aware of the requirements to do the job safely. There should be separate sessions for both contractor employees and contractor supervisors, since supervisors are vital to the success of the project. One of the biggest mistakes many organizations make in the orientation process, however (outside of not having an orientation), is to turn the orientation into a negative experience. Make the orientation only as long as it needs to be and do not talk down to the contractors. Instead, remember that you brought these contractors onsite at least partially because they have a good safety program. Acknowledging that and getting their input as part of the process can go a long way to building trust and cooperation, which is vital to building a strong safety culture. Step 4 – Feedback. The first three steps built the foundation for a safe project, now we need to follow through with feedback about the process. Remember, although they are professionals, the contractors are visitors to your site and may not be aware of your specific policies, procedures, hazards, etc. So providing timely feedback, particularly in the early stages of the contractor’s safety performance is crucial. Feedback should come in two ways – to supervisors and to employees. For supervisors, schedule a meeting to look at leading and lagging indicators for the project and make appropriate adjustments. After the job, provide feedback to the contractors and to your overall prequalification system for consideration of future jobs. For employees, providing positive reinforcement for those contractor employees who are following your job specifications (Step 1) goes a long way to getting the results you want and creating a culture of trust rather than of punishment and fear. Certainly, each of these steps require careful consideration on how they can best be implemented in your organization. One of the best ways to learn about innovative solutions is through networking with other professionals about what works and what doesn’t. Share your comments and questions about contractor management in the comments section below to continue the discussion!